We are a charity providing social clubs and day opportunities for adults with a learning disability to meet, develop independence skills and enjoy weekly activities! Social Link will be open again as usual as from Tuesday, 23rd April. ​and we will look forward to seeing you again soon! Bag yourself a bargain at the Social Link fundraiser jumble sale. We will have a designer clothes rail as well as accessories, toys, kids clothes and homewares. All donations for the jumble sale will be gratefully received - THANK YOU! 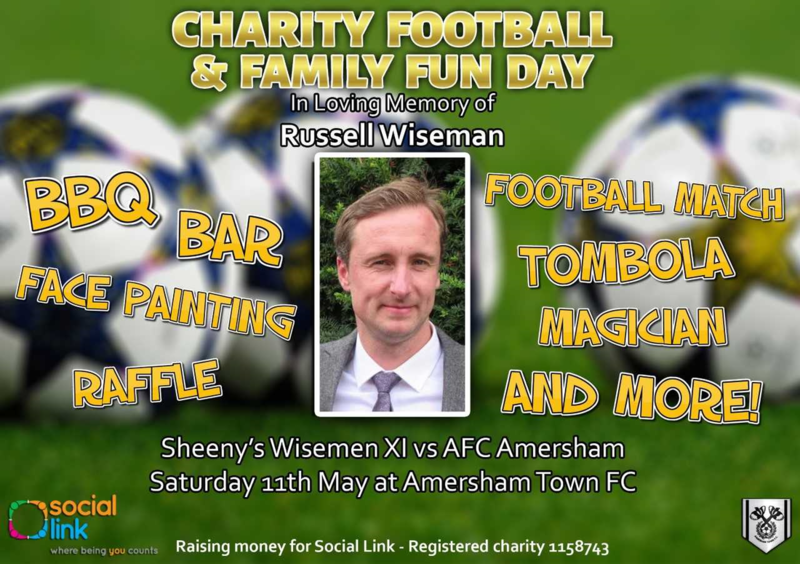 Please join us for an afternoon of family fun at the Russell Wiseman memorial Football match at Amersham Town FC. The football match kicks off at 2pm, but the fun starts at 12pm with a BBQ, licenced bar, a magician, craft stalls and games, face painting and a visit from the crew at Amersham Fire Station. Russell and his family have always had a close connection to Social Link, so when Russell sadly passed away last year, his friends worked hard to devise an event that would make him proud, encapsulate those things that mattered to him (namely football and his family) as well as raise funds for our charity. We would be delighted if you would come along and bring family and friends. Tickets cost £5 for adults with up to 2 under 16's free. Aylesbury day project opening two days per week! Starting January 2019, the Social Link Aylesbury day project will be open on Thursdays AND Fridays. To find out more or to make a referral, please call 01494 474449. We are very pleased and grateful to be the charity partner for life to White Stuff, Beaconsfield. The team fundraise on our behalf with their instore events and initiatives. A BIG thank you White Stuff!